Well it looks like the latest issue of my favorite magazine is about to ship out. The EON store was updated earlier this week, as was Zapatero's blog, who also got a major overhaul. Nice job Zapatero! Now you just need to find some time in your schedule to blog more often. Getting back to EON though, it seems that we'll be getting a few more details on the upcoming Midas Expansion, which is the next one to be released. Where's Ambulation then? I can't wait for both, and though Ambulation will certainly add to the experience, Midas will have a greater impact on the game. As such, I can't wait to read about it and start planning for it. 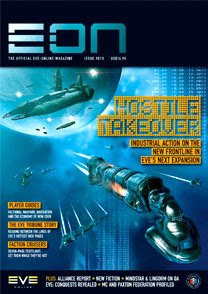 The theme for this issue of E-ON is the economy. Yes, we know it's all doom and gloom in the real world, but in EVE things are actually doing OK. Thing is, not everyone understands how it all works, yet perhaps we all should, beyond the buy low/sell high mantra that some like to wheel out to prove they've got it all figured out. Like some great unseen power, the economy of EVE surrounds and penetrates us, it binds the galaxy together. Luckily we've found someone who can teach us all about its mysterious ways without continually putting nouns before adjectives and spouting lots of voodoo nonsense... and he isn't all that diminutive either. And, no, we're not referring to CCP Chronotis, who kindly lets us in on CCP's thinking behind what will be the focus of the coming winter expansion, and why even those who might have already dismissed it as one for carebears should sit up and take notice. After a short break from fiction last issue, we have two new Chronicles for you to enjoy - â€˜The High Gardenâ€™ and â€˜Beforeâ€™. Not only that but all subscribers to the magazine will get a collection of six postcards adorned with classic E-ON Chronicle artwork sent for free with their caring, sharing E-ON. It's actually been a fair while since we gave away postcards - it was back with the second issue of E-ON in early 2006, which also had a great chronicle picture on page 56. No, wait, come back! The EVE Tribune has been reporting on what's been going on in and out of EVE almost as long as E-ON has, rummaging through the bins of EVE's rich and famous and upsetting all and sundry with war reports that may or may not be as accurate as some would like. Love 'em or hate 'em, they deserve a lot of respect though, and E-ON duly steps up to tell the tale of Tribune. Mr M doesn't reveal all on page three, but he comes close. As if a guide to EVE's economy wasn't enough, we have Sivona trying out the best Faction Cruisers, a meandering and enlightening journey through Factional Warfare and a run through all the methods that you can employ to figure out where to go, and how to plan, in EVE should you be in travelling mood.